Our Drive to Zero initiative starts with a belief that zero is possible – zero injuries, zero spills and zero violations. This belief and commitment is an integral aspect of our operating culture and serves as a central theme in our safety, health and environmental (SH&E) policy. Our commitment to 100% compliance with our environmental requirements is a demonstration of our corporate value of responsibility and a way to protect the well-being of our neighboring communities and natural surroundings. As a global company, we have seen environmental regulations evolve for a number of reasons, including updated scientific research, shifts in priorities from governments or market changes designed to improve the overall environment. As a result, we closely monitor the evolution of regulations affecting our facilities and diligently work to remain one step ahead of the requirements. 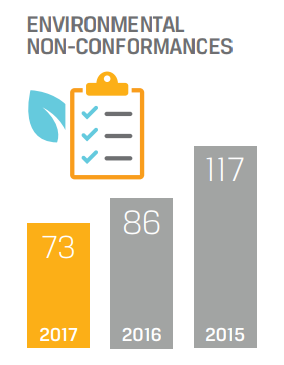 We routinely monitor our performance in meeting these standards and have been successful in reducing our environmental non-conformances (ENC) metric over the past several years. We define an ENC as any event resulting in a reportable spill or release, a notice of violation, a public complaint or a regulatory permit deviation. As part of our “Drive to Zero” initiative, we maintain the philosophy that all ENCs are preventable. We learn from these events, share the results of root cause investigations throughout the organization and continue to reduce the number of ENCs by updating equipment, revising procedures, adopting best practices and training employees on important environmental compliance practices. In 2017, we continued to reduce our rate of environmental non-conformances (ENCs). We saw a 15% reduction compared to the previous year and a 38% reduction compared to 2015.